Cherrington Beach cleaners are multi-use. Use on ocean beaches, lakeshores, playgrounds, horse tracks, sludge drying beds, landscaping sites – anywhere where an efficient Mobile Screener is needed! We build Cherrington Beach cleaners to give you many years of effective service. For nearly three decades Cherrington Beach cleaners have been getting better and better! You can count on Cherrington. Below you will find the latest Cherrington Industry Related News. New this Spring to Jenkinson's at Beautiful Point Pleasant on the Jersey Shore - A Cherrington Model 4600! The Jenkinson's Beach at Point Pleasant is now more pleasant than ever! It is being screen-cleaned by the Cherrington Model 4600. The Cherrington's unique Lift and Screen cleaning method removes unsightly and unsafe garbage and debris from above and below the surface of the sand and leaves the sand fluffy and aerated for your beach going pleasure. Congratulations, Jenkinsons! The company Kässbohrer Geländefahrzeug AG has expanded the BeachTech division product range. Kässbohrer Geländefahrzeug AG acquired the beach cleaning product line of American company, Cherrington Enterprises Inc., as of February 1, 2017. With this, BeachTech, the company's division for producing beach cleaning machines, will further establish its position as the worldwide largest supplier of beach cleaning machines and attachments. By including the Cherrington models in its range, BeachTech broadens its portfolio for a better market coverage. This takeover combines a total of 65 years of experience in the field of beach cleaning and offers customers a wide variety of solutions. There will be three self-propelled models with different cleaning widths available under the well-known trademarks of BeachTech and Cherrington. The range of the pulled type cleaners will also grow and customers can choose between several sizes and different screening techniques to find the perfect machine for their requirements. Cherrington now offers a stamping attachment for leaving impressions in the sand as you screen! This optional attachment allows Cherrington users to leave a custom message in the sand. The message could be the resort name, logo, or a special message - the marketing possibilities are endless. It makes for a great photo opp on your beach - your message will be on social media all over the world as your beach patrons are sure to click and share a selfie! Cherrington is pleased to announce the sale of its 5th Cherrington Beach Cleaner Model 5500 to Bee'ah, the cleaning company from Sharjah, United Arab Emirates. Cherrington recently sold 2 of its compact ride on model 3000’s in Singapore. The Model 3000 is a great beach sand screener, capable of screening the beach sand to 13mm to remove cigarette filters, glass, trash, debris, and seaweed. Sentosa Island is happy to now be using Cherrington at their resort and look forward to adding another to their fleet soon. Chye Thiam Maintenance Pte. 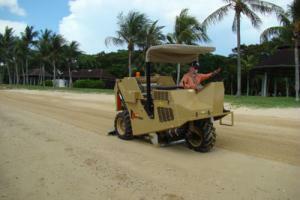 is also using the Cherrington 3000 for beach cleaning at Pasir Ris Park, Singapore. Cherrington Beach Cleaners is proud to have been chosen to supply a Beach Cleaner for the Burj Al Arab Hotel in Dubai, the world’s only 7 star hotel. 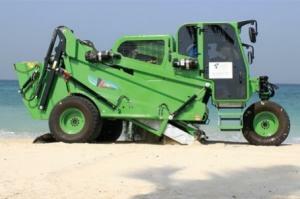 This is the second Cherrington Beach Cleaner Model 5500 purchased by the Jumeirah Group. They also use a Cherrington 5500 and two Cherrington Model 3000’s at the Madinat Mina A’Salam, also in Dubai, United Arab Emirates. 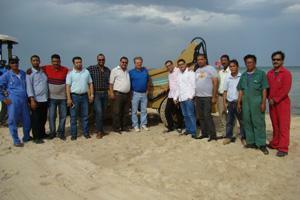 Cherrington, through their distributor, Zahid Cat/The Cat Rental Store (Saudi Arabia), sold three tractor model 4600XLs to Rezayat Company LTd., who has been contracted by Arabian Oil Company (ARAMCO) to restore Al Okair Beach in teh Al Hassa Region of Saudi Arabia. The commissioning of the three Cherrington Beach Cleaners was held on April 11, 2016. 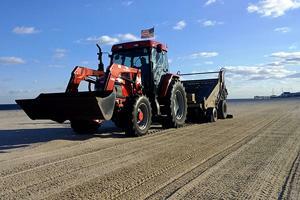 Despite inclement weather conditions, the Model 4600s performed perfectly on the beach. The Cherrington Model 4600XL is a great beach cleaner with low maintenance and exceptional results. New Cherrington 5500 for City of Miami Beach, FL, USA. 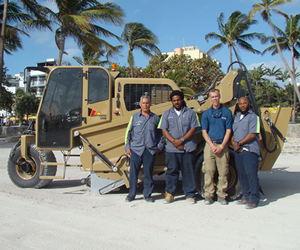 Cherrington recently delivered a new 2016 Model 5500 beach cleaner to the City of Miami Beach. Cherrington recently delivered a new 2016 Model 5500 beach cleaner to the City of Miami Beach. The Cherrington 5500 was chosen because it is a high-capacity beach cleaner in a compact, self-propelled unit, and especially its air conditioned cab. Miami Beach has been an owner of Cherrington Beach Cleaners since 2006. This new Model 5500 is now their second Cherrington. The Cherrington’s fixed, but oscillating, sand sifting system is low maintenance with carbide wear points, an entirely galvanized screen bed, and optional stainless steel sifting screens. The Cherrington 5500 can be legally driven on streets or easily be transported on a standard roll-back truck. The Cherrington 5500 is right choice to keep the pristine beaches of Miami in perfect condition! Cherrington recently delivered three Model 5500 self-propelled beach cleaners to the City/County of Honolulu. Cherrington recently delivered 3 ea. 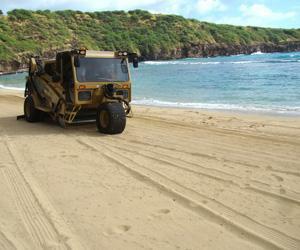 Model 5500 beach cleaners to Honolulu, Hawaii to maintain several beaches on the Island of Oahu. 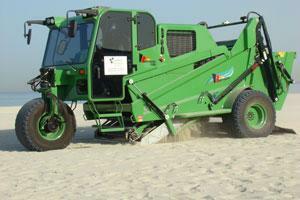 The Cherrington 5500 was chosen because it is a high-capacity beach cleaner in a compact, self-propelled unit. The Cherrington’s fixed, but oscillating, sand sifting system is low maintenance with carbide wear points, an entirely galvanized screen bed, and optional stainless steel sifting screens. The 5500 uses a fuel-efficient 64 hp diesel engine and offers all the capacity, speed and comforts of full-sized tractor-beach cleaner combination. The Cherrington 5500 is only 17 ft long and can be legally driven on streets or easily be transported on a standard roll-back truck. The Cherrington 5500 is right choice to keep the pristine beaches of Hawaii in perfect condition! Beach Cleaning: The Way Forward! Beach cleaning technology and Cherrington, specifically, featured in CLEAN MIDDLE EAST - the region's leading cleaning magazine.